CONNECT... A 10 Gigabit enabled network, diligently engineered to give you dependable and low latency connectivity. Our tried-and-true, low-latency IP transit service gives you dependable global reach at a price that will help you to get the most out of your IT budget. Ninety percent of our traffic is exchanged over peering for the best possible efficiency and performance. And those peering relationships are at the largest exchanges in the world: LINX and AMS-IX. The remaining 10% of our traffic is routed by high quality Tier 1 carriers, such as Level 3. We deliver the reassurance of generous overheads on backbone links: we run at less than 80% capacity to rule out congestion. Plus, we’ve got much sought-after peering with the key eyeball network providers, including both BT and Virgin. Three types of IP Transit — what's the difference? 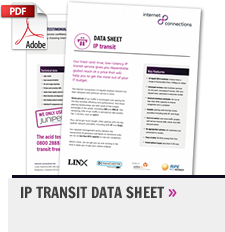 Get the lowdown on our IP Transit products: hover over the icons for more information on each area, and how this differs between each offering. Let us know whether you want full, partial or Level 3 transit, the bandwidth you need, and the type of port (GE copper or GE fibre) — we'll do the rest. Ideal for situations where there is a requirement for high quality, highly reliable IP transit for connecting servers to the Internet, and where you don't want the overhead of managing your own peering relationships, or to run a national network (we take care of all that for you!). Where a full transit connection from another supplier is already in place, partial transit can be used to reduce expenditure by utilising lower cost peering routes. No extra resilience is gained, but latency (response time) and routing quality (general reliability) will be improved. The solution for when you want to manage your own relationship with a tier 1 network — maybe using this service in combination with partial transit to give you complete control over your routing. Ready to talk? 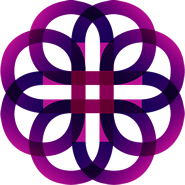 Whether you're coming to us armed with all the knowledge you need, and just need to iron out the final details, or you'd like the full lowdown on what IP transit can do for your business, we're ready and waiting to help.